Pierced is an excellent novel, even better than the author’s very good debut novel, Burned. In Burned, we learnt that Oslo-based journalist Henning Juul has just returned to work at 123 News after being severely burnt in a fire in his flat one night two years ago. His 10-year-old son Jonas was killed in the fire. In Pierced, Juul is contacted one weekend by Tore Pulli, a prisoner whose appeal is coming up. Pulli asks Juul to find evidence that he is innocent of the crime he committed. The hook is that Pulli knows something about the fire in which Juul lost his son, and will tell him about it in return for Juul’s help. Juul cannot remember anything about the weeks before and after the tragedy, so clings at this straw and spends most of Pierced following up his unusual task, which involves the world of men’s gyms, strip clubs, body builders, enforcers and others who live on the wrong side of the law. At the same time as following some very subtle clues, Juul tries to put together his shattered personal and professional life. His marriage broke up after his son died, his wife Nora leaving him for his work colleague, star journalist Iver Gundersen. Juul’s strange friendship with Gundersen is a continuing feature of Pierced, the dynamics between the men, and each of them with Nora, being one of the pleasures of this novel. There are other strands to the plots of Pierced, which combine to make the novel a great combination of detection and thriller as Juul is unknowingly in a race to solve Pulli’s case before some Swedish villains get to him in a subplot that is extremely tense and very sad. And why are the Swedes keen to silence Pulli: is it because they were involved in the crime for which he is serving time, or is there another reason, perhaps closer to home for Juul? Although there is less of the journalism theme, and humour, in Pierced than in Burned, it is endearing that Juul sees the world through the eyes of a wordsmith. He cannot erase his wife from his life “like a typo”, and when he hurts her by bringing up the subject of their dead son, a taboo, he realises that she gets through each day by “applying correction fluid” to her deep grief. There are also some neat crime-fiction references: to Eva Joly, the French (Norwegian-born) anti-corruption magistrate and now novelist; and to a book by R. N. Morris, which provides a clue. I urge you to read this novel (ideally after reading Burned), and hope you enjoy it as much as I did, even though it is written in the present tense. Its pleasures are enhanced by the excellent, colloquial translation by Charlotte Barslund. I received this book via the Amazon Vine programme. Publisher’s website: about the book, including a video of the author talking about it. [Update 17 August: comments are now sorted, somewhat belatedly.] Because of a Word Press bug, comments to this article have been disabled. I hope Word Press will resolve this, but in the meantime, if you would like to comment, please send it to me by email (maxinelclarke AT gmail DOT com) and I’ll post it for you via the blog dashboard. Comments are not “closed”, this is a Word Press bug. It seems that I can post comments via the dashboard, so if anyone wishes to comment, please email me at maxinelclarke AT gmail DOT com, and I’ll post manually (I hope WP will fix this bug, I have reported it). I’ve skimmed this review as I have the book to read but I can see that you clearly enjoyed it. 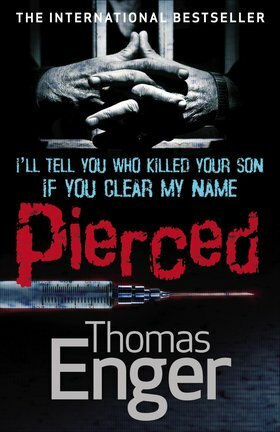 I thought Enger’s first book ‘Burned’ was very good and I think I am going to read ‘Pierced’ this week as I am in need of a good solid read.